with my camera this Summer. and I have my nose in the seed catalogs. I had this lovely plate sitting on the table. 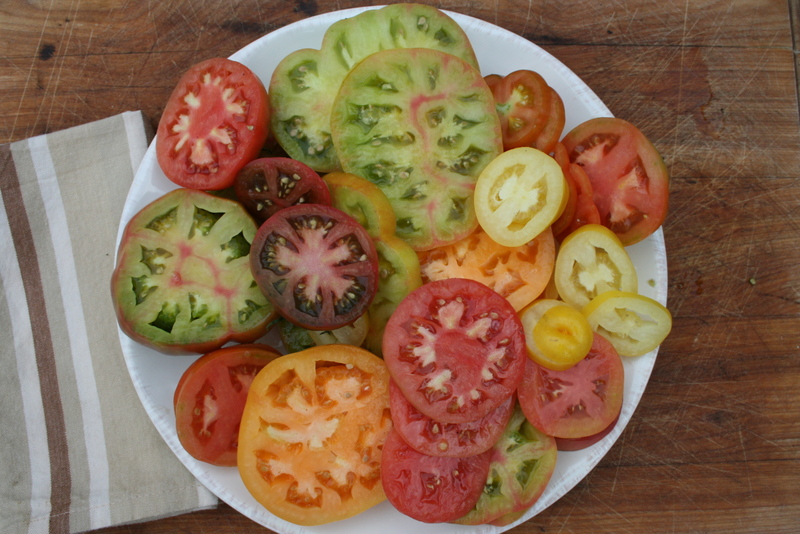 How do you like to eat your garden fresh tomatoes? Previous Post So proud. Very, very proud. What a great idea. Right now I have a window sill dedicated to each of my varieties of tomatoes. I’m taking photos of the whole tomatoes but should be taking them sliced as well. I like the idea of putting them out on my chalkboard and writing the names, like I did the radishes. I have got to try the balsamic vinegar this Summer! Oddly enough, I don’t! (Like eating them.) I do like hearing how they taste when DH eats them though. For me, all of the fun is in the growing of them. I know lots of people who don’t eat tomatoes! including my DH! but he loves the salsa, the sauces etc….just not raw tomatoes! Hope to make some spaghetti sauce and can it….still on salsa. I was able to plant nearly 3 weeks early this year–but the tomatoes still took forever to ripen–it was too hot at night! But they are coming on nicely now–we are going to be in the 40’s tonight!